This is too delicious. I will have to wait until the weather changes here in Texas. Too much humidity and it's a chewy diseaster! Maybe the Worlds most perfect dessert! The dessert loooks so lovely, fab even! 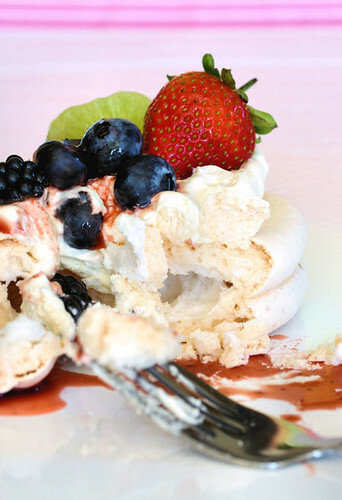 The mini pavlova's look totally delicious and captures summer berries perfectly. These are so adorable, Nic! One of my favorite desserts. Nic, I love the contrast between the colorful fruits and the ethereal, little clouds of meringue. Btw, this just reminded me of the 6 egg whites I had stored in the fridge, over a week ago. I think I'm gonna cry. but i don't wanna say goodbye!! could it really be over already? bah! i love your presentation here, nic--the gorgeous berries (and kiwi?) 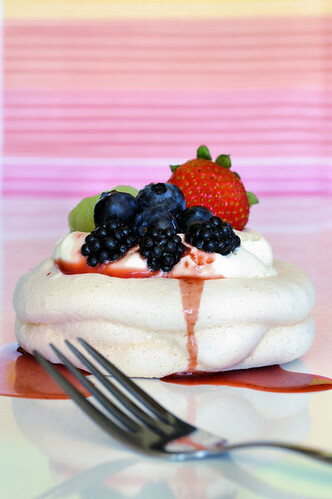 and the pure white pavlovas make a stunning dish! Looks amazing! All I have to say is... YUM! Aah far too pretty Nic. Wouldn't have the heart to 'fork' it...look at all the enviable summer fruit on it. At least I got to taste the dried version (thanks to you LOL). I love the idea of a soft meringue & this seems more fun with whites for now, after the macaron mess I've dragged myself through. Gorgeous picture!! This is such a beautiful presentation. They look delicious! The perfect way to use the last of your summer berries. Stunning photos. Oh my goodness. This looks so delicious. I've never made pavlova before, but have always wanted to. Guess I"ll have to wait until next summer? Fantastic pictures as always Nic! They look so good with all that fruit on top! A beautiful goodbye to summer! I have been making Lazy Pavlovas for weeks. I have been finding the most beautiful peaches. I slice one almost every day at lunch and top it with a dollop of whipped cream and one of my chocolate chip meringue cookies. It is not as beautiful as yours but the taste is fantastic. Your presentation is beautiful and the fruit looks so appealing! REAL meringues, like yours, rock. So sad that most people only ever have the nasty dry ones. I like the fact that it is a softer meringue.Yum! I would love to try this recipe and experience what you have with this delicious dessert! Sweet and nice tribute to the end of summer ! A beautiful dessert! I love pavlovas the first time I had it in Australia. Always wanted to make it at home but never got around to it yet. I'm really encouraged after looking at yours. This looks so beautiful Nic.Great presentation. Yes, summer is well and truly over. Beautiful,as always! Pavlova is one of my favourite summer desserts. I can't beleive it's the end of summer already! Wow, those look seriously tempting. That looks amazing! You are so cruel tempting us in this way! A great way to say goodbye to summer! These are beautiful little delights, delicious! This is truly a great way to enjoy the last of those juicy berries! So sad summer is gone but so much to look forward to! Those are beautiful! By the way, I finally posted the recipe for the Norwegian almond cake you were interested in. Enjoy! It was such a pleasure to have you visit! The Leftoverist - you can use any fruits in season, not just the soft summer ones. I have been dreaming of making a pavlova ever since I first ate it a few weeks ago! I must make it as soon as strawberries arrive in December. Your pavlova looks so good!